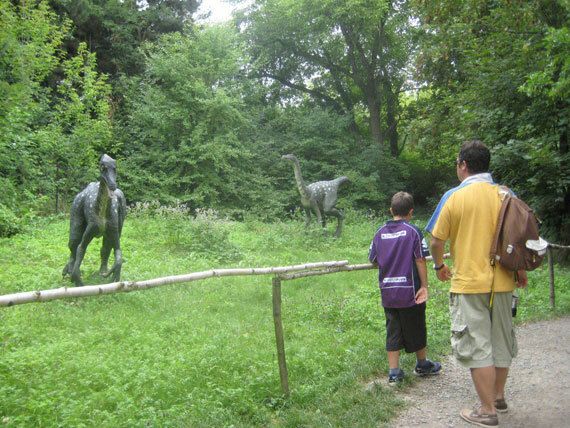 If you are after a more ‘realistic’ and ‘natural’ dinosaur experience with your kids, then this Moravian dinosaur park is definitely the way go. 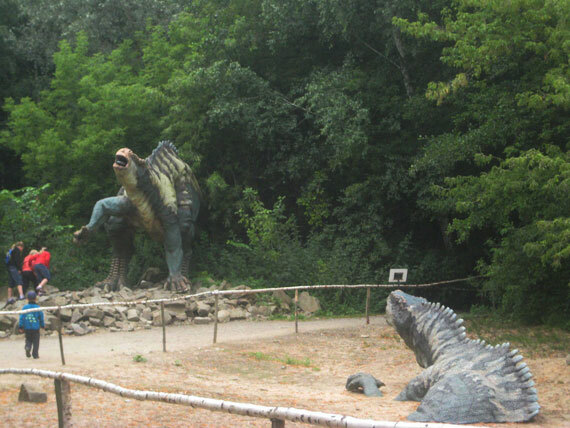 After having already seen 2 Dino Parks in the Czech Republic, namely Plzen Zoo and Galerie Harfa, which I absolutely adore, Vyskov’s DinoPark was a different kind of experience. Vyskov is a town about 30 kms from Moravia’s capital Brno. 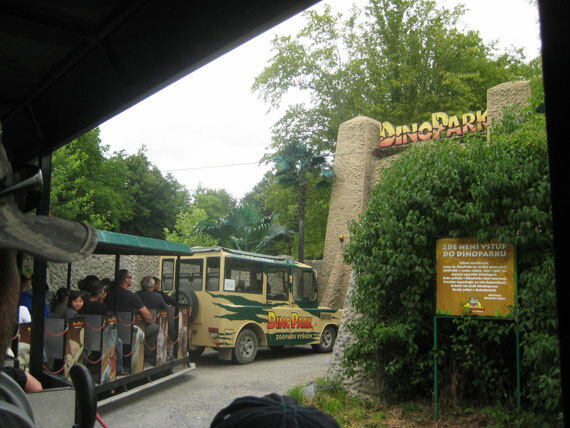 The Dino Park is actually connected to the town’s zoo but what makes it a little more different is the fact that in order to reach the Dino Park, you must first board a special DinoExpress Train, which after a 20 minute trip through the streets of Vyskov eventually takes you to a fenced, forested area, where large wooden gates slowly open. 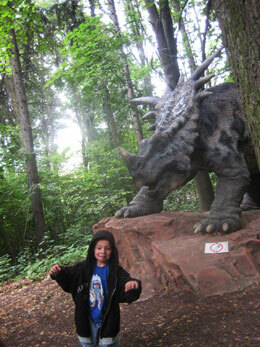 Only then will you find yourself in the land of the dinosaurs. I must admit that I was much more appreciative of the mini-tourist drive preceding our arrival to the Jurassic park, than my sceptical husband. Once inside the walls, you will be greeted by a whole bunch of fascinating models, which often move their heads, tails or other parts of the body and make various animal sounds (I always wondered how the archaeologists could ever tell, what a dinosaur growl could sound like?). Each model has its own label that will tell you basic information about each dinosaur (size, origin and the approximate time when it roamed the Earth). The labels are only written in Czech but are easy to decipher). 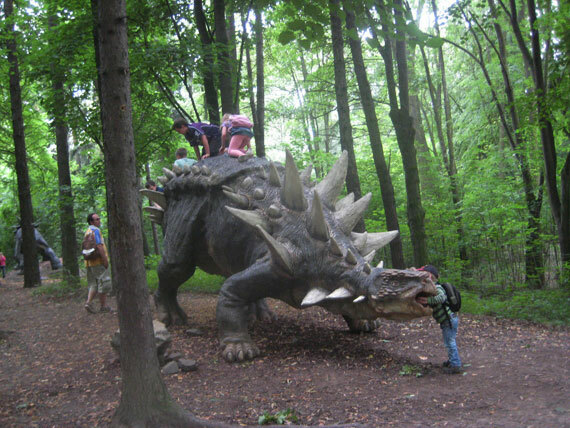 If you would like to have a more detailed history and description of the types of dinosaurs that you are looking at then please refer to Darina’s wonderful list on her Plzen entry. 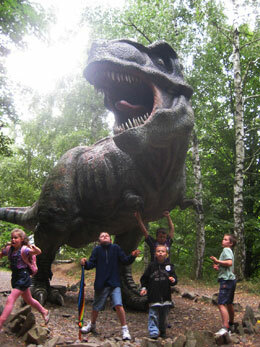 My overzealous nephews and nieces from Sydney even managed to climb on top of several of the models, which I’m not completely certain, is actually allowed but they were just too quick to be stopped – they especially loved getting their hands on the super-model of the park – the formidable T-Rex! After having seen all of the dinosaurs, it is always fun to view the 15-minute, 3D film (included in the price of the entry ticket), which tells the story of the life- journey of a Giganotosaurus. 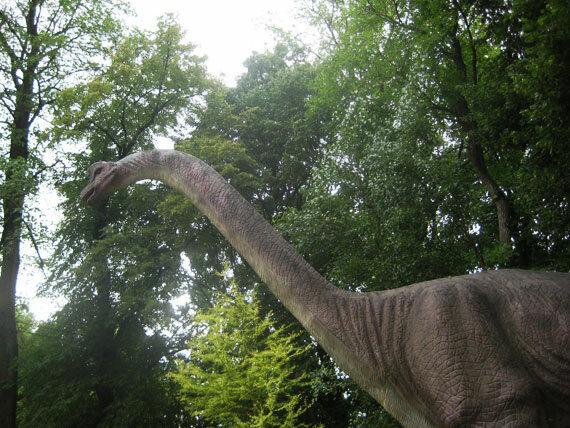 This is a relatively new dinosaur on the scene as its remains were apparently only first discovered two decades ago in present-day Argentina. I would probably not take in children under the age of three to see the film, as it may be slightly frightening for them. Little ones can enjoy the sand pit/excavation grounds full of dinosaur remains to uncover if they look hard enough in the sand, while the adults can admire (behind bars), the once very rare and precious Wollemi Pine (WOLLEMI NOBILIS), which grew at the time of the dinosaurs. The Wollemi pine was first found less than 20 years ago in the bushlands of the Blue Mountains, just out of Sydney, Australia. Initially the spot was kept secret and fiercely guarded as they only had a mere 39 samples of it to start with. Today, the Wollemi pine can be bought in a pot at nearly every supermarket, so many an Australian will have a piece of prehistory on their kitchen window sill. OPEN: April: open weekends from 9am to 6pm; May: open weekends and then from 14.5. open daily from 9am-6pm; June-September: open daily from 9am-6pm; October: open weekends and 30.10 from 9am-6pm. 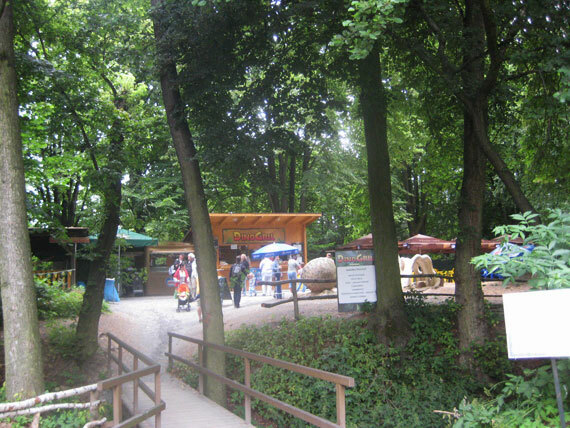 DIRECTIONS: By Car: If coming from Olomouc, turn left at the supermarket LIDL towards the zoo parking lot. 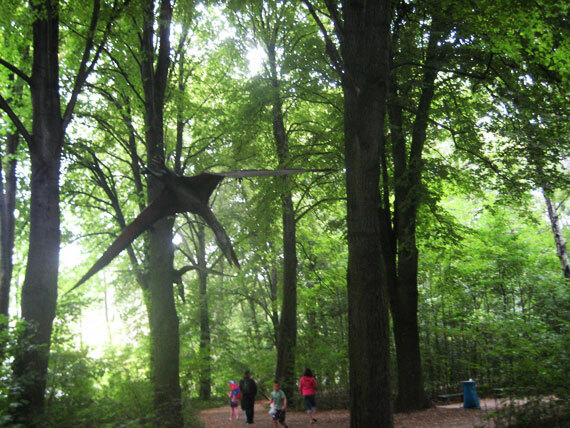 Throughout the whole of Vyškov, there are brown information signs marked with ZOOPARK, which will show you the way. If the parking lot should be full, then it is possible to use the parking lots of the various supermarkets nearby. From the Bus Terminal: Walk through the streets of Brněnská - Hřbitovní - Cukrovarská to the main entry of the ZOO (about 300m). From the Main Railway Station: Walk through the streets of Nadražní - Hřbitovní - Ckrovarská to the main entrance of the ZOO (about 300m).